A total solar eclipse occurred across much of the United States on August 21, 2017. In order to see this eclipse as a TOTAL Eclipse, you had to be in the path of totality indicated on the map. If you were not in the path of totality you witnessed a partial solar eclipse. Additional information will be posted in a few weeks. This photo below show totality if you were in the “path of totality” indicated on the map. Totality = When the Moon covers 100% of the Sun. This photo is of the Total Solar Eclipse viewed in the South Pacific 2005. 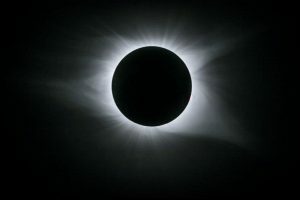 During totality, The red chromosphere is visible in this eclipse due to the fact in this eclipse the Sun and Moon appeared almost the same size in the sky. Usually the Moon will appear larger than the Sun and most of the chromosphere is hidden from view. 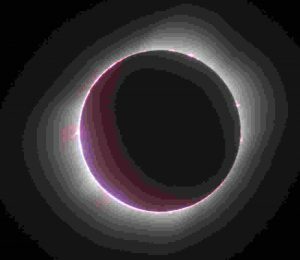 In the eclipse of August 21, 2017 some of the chromospher was visible for those observers in the path of totality. Remember you need special solar filters to protect your eyes if you plan on viewing any part of a solar eclipse before or after totality. If you are located in the path of totality, solar filters are not needed during totality.